JTC Valve Sales carrie's Flexible Components brand bulk tank and truck hose that is specifically designed for the extreme requirements of bulk loading and unloading. Heavy-duty construction delivers longer hose life, enhanced operator safety and quicker fill times. • Full coverage, large diameter wire braid for maximum abrasion resistance. • Heavy gauge braid provides a higher pressure rating, a greater safety factor and better protection to the inner core. • End fittings exceed ANSI ratings, eliminate thread sealing problems and will not warp. • High standard welding procedure allows for a smooth transition from corrugation to fitting, reducing product entrapment and pressure loss. • Casing weld ring prevents armor casing from pulling away from the fitting and serves as an identification ring that provides the date of manufacture, MAWP and a unique identification mark. • Closely pitched, omega shaped convolutions provide maximum flexibility and longer hose life. 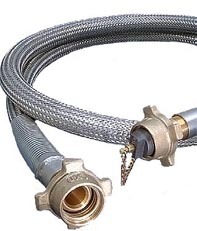 • Shallow convolution height minimizes pressure drop inside the hose. • Heavy-duty armor cuffs prevent strain and overbending at hose ends. • Armor cuffs support the weight of the hose, remove stress from the end fittings and inner hose weld, and provide a safe handling point for the operator. • 18" length standard. Custom or full-length armor casing optional.